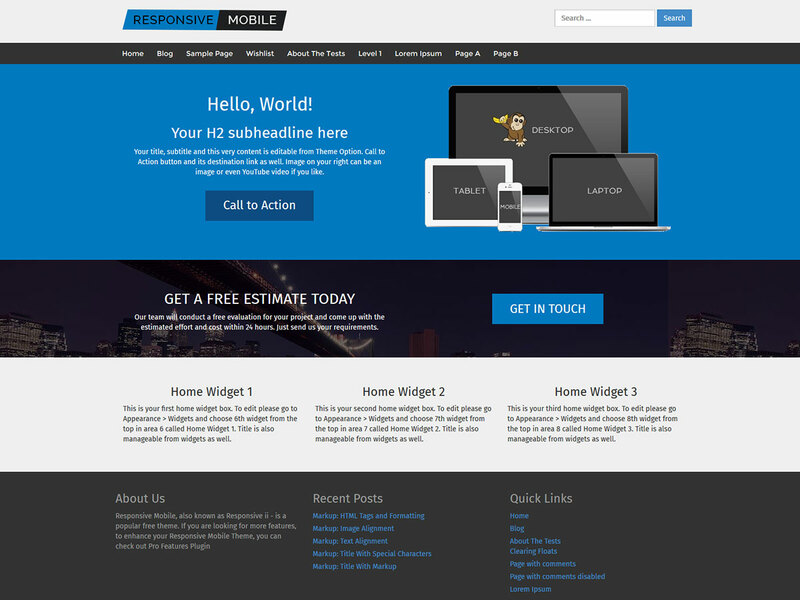 Parallax is a free Parallax Theme perfect for WordPress websites of any niche. Includes Drag and Drop Builder for Visual Elements, so you can make each landing page stand out. Parallax is a popular Free WordPress Parallax theme from CyberChimps WordPress Themes that enables you to create stunning websites with parallax scrolling effect. Parallax offers touch-friendly drag-and-drop options on a per-page basis allowing you control the look and feel of every page. Responsive parallax Design works perfectly on all smartphones, tablets, and desktop computers. Parallax uses the latest in parallax scrolling to present beautiful background images. What is a Parallax Theme? 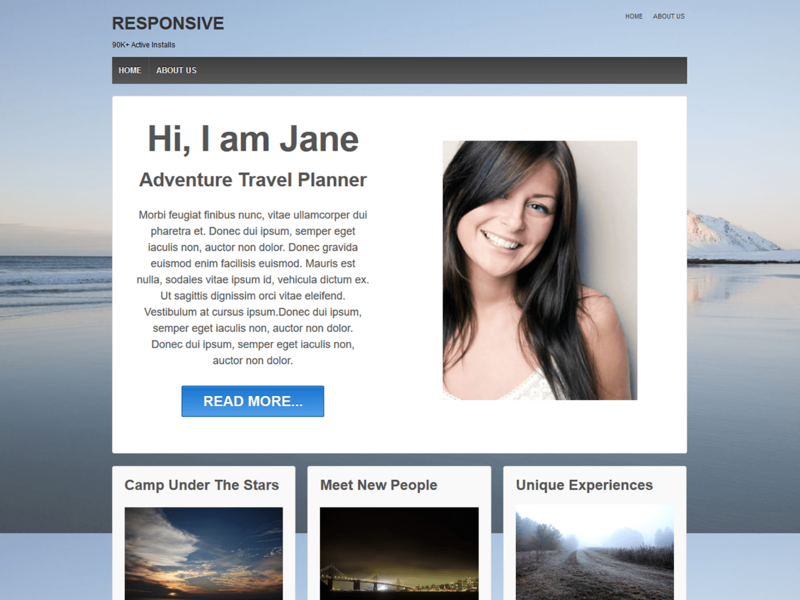 A Parallax Theme is based on Parallax Design / Scrolling. Basically, the term parallax means the variation in the appearance of an object depending on the position of the viewer in relation to it. An example can be something like – when you are travelling by car, you will feel that you are almost about to collide with the road divider if you look at it from the passenger seat. However, if you are driving, you will know how far you actually are. Parallax design entails giving the illusion of depth to an object. It makes a 2D image appear 3D. This is done by creating an optical illusion where the images in the foreground move at a different speed than those in the background. This concept was used in 2D video games to make it look as if it is actually 3-dimensional. It isn’t very difficult for you to create a parallax scrolling effect for your WordPress website using HTML or CSS. The fact is, it is actually quite simple if you know what code to add where. Given the recent trend of parallax scrolling in so many websites, you should also consider giving it a try. And the best part is you can remove it any time you want, or even add it to only a specific portion of your website. There are some advantages and useful features of parallax design apart from the visual appeal that make it a popular feature in web design. Let’s take a look at some of the reasons that work in its favour. It is a great way to present your website or product and make it memorable. People will remember anything unique and eye-catching, and parallax is one way to do it. Parallax allows the user to give an amazing 3-dimensional effect to your product and display/advertise it from various angles. This is a great method for storytelling. Parallax can be used to build/tell a story to the audience in an engaging and interactive manner. It is an excellent way to display photos if your website is more pictorial based. For example, fashion websites, modelling websites, etc. can make good use of parallax scrolling. A great way to build an ‘About Us’ page or a history of the company is by making use of parallax. You can take your viewers on a journey with amazing effects and graphics. Parallax used to create an engaging and interactive story goes a long way in increasing user engagement by generating interest. Users get hooked to a well-made parallax concept which increases on-page time as well, and can lead to more conversions that a conventional website. Parallax can also be used to engage users in games or contests such as puzzles, dress up, quizzes, etc. This helps capture their attention, make them curious, and give them something fun to do as a means of interaction. A call-to-action at the end of a well-made parallax website is more likely to be clicked. Parallax makes your website unique and memorable, and gives you a chance to get creative. Who will come up with something amazing and unforgettable on a quintessential website? These are the latest trends that parallax-using websites are following. Given the latest boom in unique, one-page websites, parallax surely takes the cake! – Create 3D animation effects to captivate viewers. – Make the website more interesting and induce curiosity. – Ensure longer on-page time and viewer engagement. – Drive more users to the call-to-action buttons. much of anything used unnecessarily always backfires. – Many parallax designs are not compatible with mobile devices. – Internal page links are not possible. The key to using parallax successfully in a website is exercising moderation and adding it to only certain portions. If done right, parallax can greatly boost your website’s views and engagement. What makes this one of the Best Parallax WordPress Themes? Want more customization features? Upgrade to Parallax Pro!